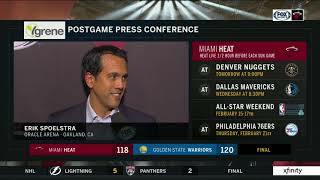 Miami Heat coach Erik Spoelstra and Dwyane Wade talk about the thriller against the Golden State Warriors. The song of POSTGAME REACTION: Miami Heat at Golden State Warriors 02/10/19 is just for review only. If you really love this song"POSTGAME REACTION: Miami Heat at Golden State Warriors 02/10/19", please buy the original song to support author or singer of this song.